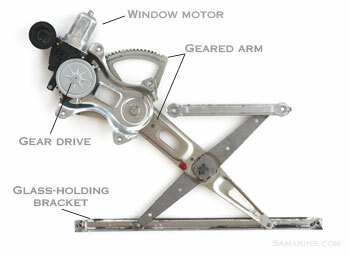 The mechanism that moves the window up and down is called the window regulator. 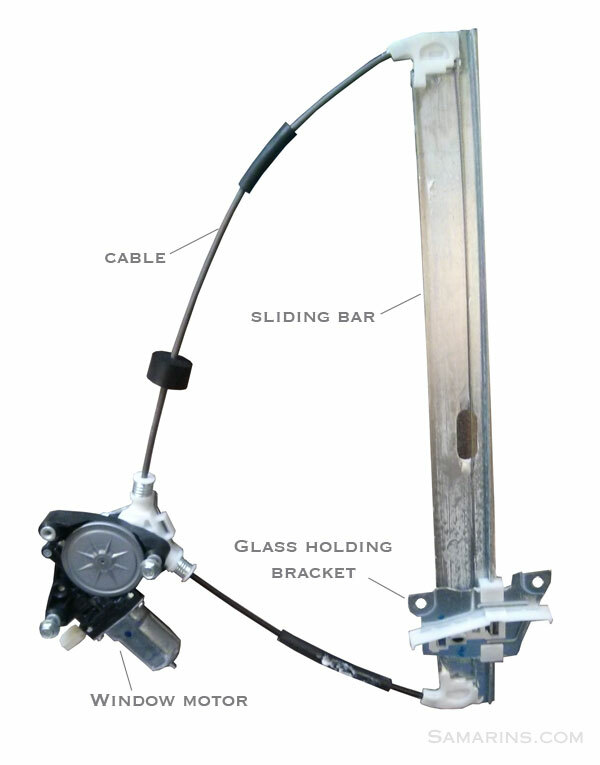 In some cars, the window motor comes with the window regulator as one unit (see the photo); in others, the window motor can be replaced separately. 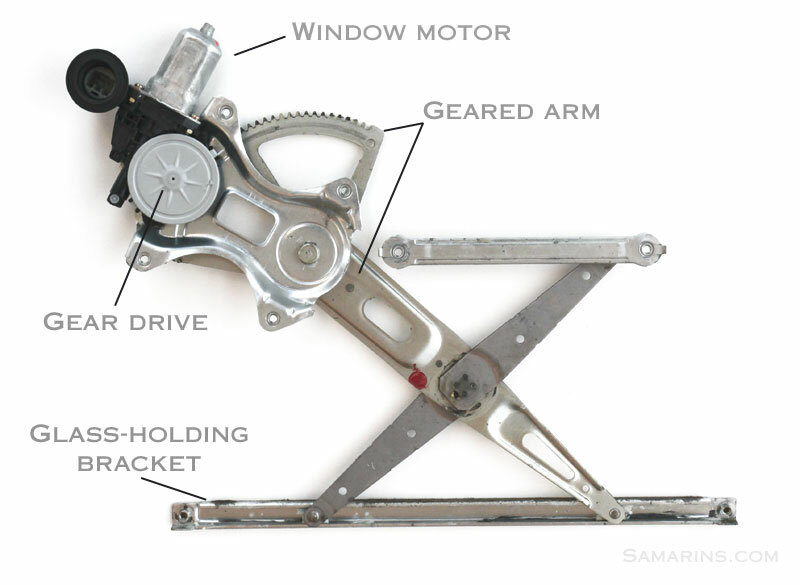 There are two basic types of window regulators: the cable type (the top image) and the gear-drive type (the image below). There is one window regulator in each door. A window regulator doesn't need any maintenance or adjustment. If it fails, the failed part or the whole unit must be replaced. 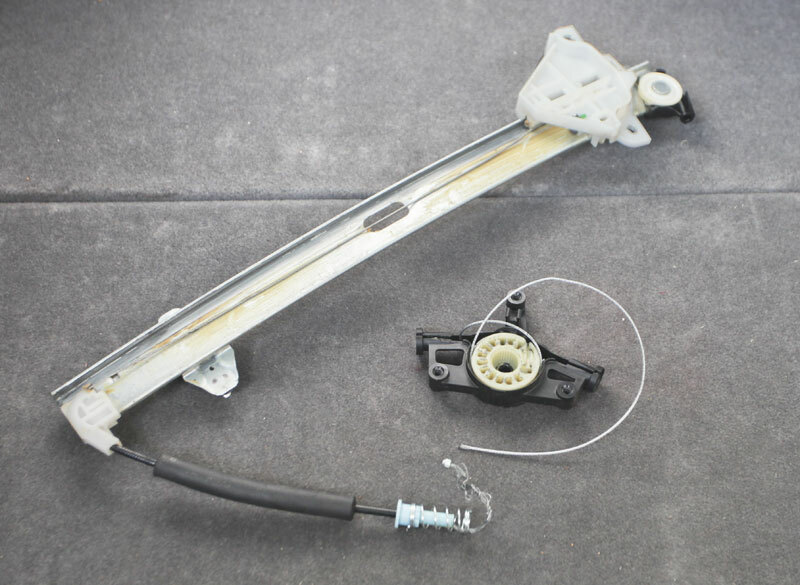 A broken window regulator cable can cause the window to jam or fall down inside the door. See this example, where the cable broke and the power window stopped working. Worn out cable guides or a frayed window regulator cable can cause abnormal noises when the window is moving. For the same reason, the window may not go up or down all the way. In cold temperatures, the window may freeze in closed position. When the window switch is operated down, the window can separate from the window regulator. If this happens, in some cars, the window can be re-secured without replacing parts, in others the window regulator might need to be replaced. A car is considered unsafe when power windows don't function properly. Several car manufacturers issued recalls to address concerns with a power window mechanism. You can check if a car has any outstanding recalls at the NHTSA website. - when the window switch is pressed, the window motor runs but the window doesn't move. Power window goes down, but not up, the motor is not running when the switch is in "UP" position. In this case, we know that the window switch, the wiring and the window motor work. That means the problem is with the window regulator. We would still have to take the door cover off and check if the window motor gear is not damaged and if the glass is still connected to the regulator. We know the motor works. 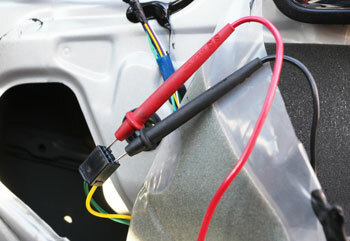 The main switch on the driver's door is common to go bad. We can try wiggling the switch in "UP" position and if it makes the window motor run, then we know the switch is bad. If it doesn't, then we would have to follow the electrical diagram and check the power window circuit. We would have to check the window run channels and the window regulator mechanism. Sometimes window run channels wear out or shift out of place. The window run channel is not expensive and is not very difficult to replace. Often lubricating window channels with a special silicone lubricant helps. 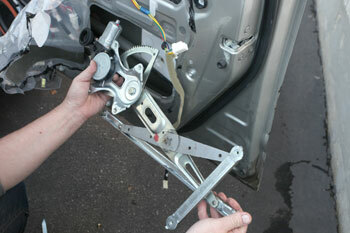 The sliding parts of the window regulator may also need to be greased. If lubrication doesn't help, the window regulator may need to be replaced. In many cars the power window have the anti-pinch function that reverses the window from going up when an object is pinched by the window. 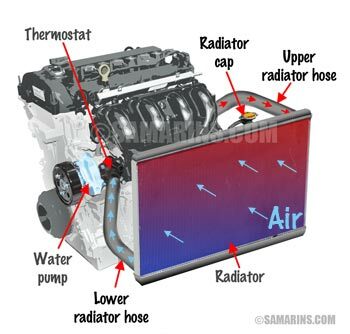 Sometimes, after the window motor or regulator has been replaced or the power has been disconnected, the initial power window settings must be relearned for anti-pinch function to work properly. The re-learn procedure is different for different cars. Try googling 'power window re-learn procedure Make Model Year', there are plenty of Youtube videos how to do it. 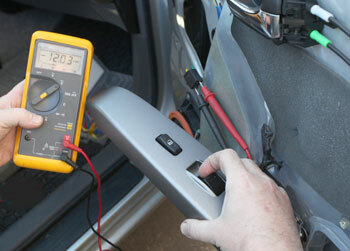 If the window motor doesn't operate at all, the first thing to check is the fuses. See: how to check fuses. 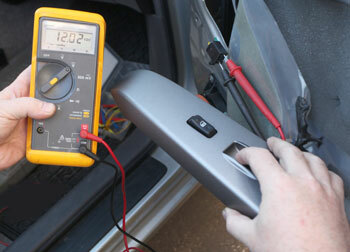 If the fuses are OK, the next step is to check the voltage at the motor and test the motor itself. 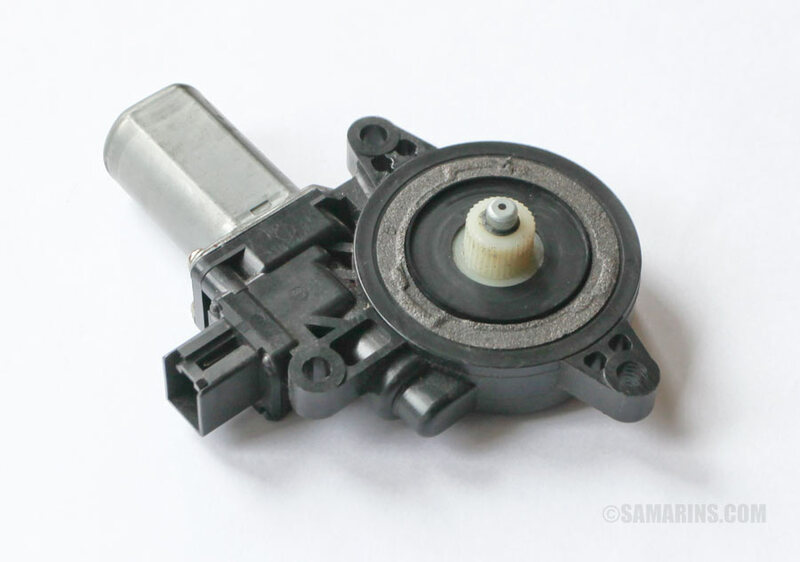 It's not uncommon for a window motor to go bad. See how to test a window motor below. Replacing the window regulator is not very expensive ($50-140 labor, $40-$180 part) and aftermarket parts are often available. Some dealers have parts in stock. As a DIY project, the window regulator replacement rates from 5 to 7 on the scale from 1 to 10, with 10 being the most difficult. You might need to enlist one of your friends to help, as the glass needs to be held in the top position while the window regulator is replaced. It's also very common for door cover clips to break whenever the door cover (panel) is removed. You may want to order a couple of new clips. Typically, there are 8-10 clips holding the door cover. With the ignition switch "ON", press switch and fully open the power window. Next, pull up switch to fully close power window and continue holding switch for about 2 seconds after window is fully closed. Repeat the same steps for the front passenger window from the passenger door switch. In this car, the window motor in the right front door stopped working. Pressing the window switch up or down does nothing, however all other windows work. We checked the service manual that says to remove the interior door cover and check for battery voltage at the window motor connector. The manual says to operate the window switch and check for the voltage at the connector. When the window switch is pressed "Down" the multimeter measures 12 Volts, so we know there is power at the window motor switch. When the window switch is pressed "Up" the multimeter shows -12 Volts, because the polarity changes when the window switch is moved from "Down" to "Up" position. Next, the service manual asks: does the motor operate by connecting the battery voltage directly to the motor? We did it and nothing happens, the window motor is bad and must be replaced. 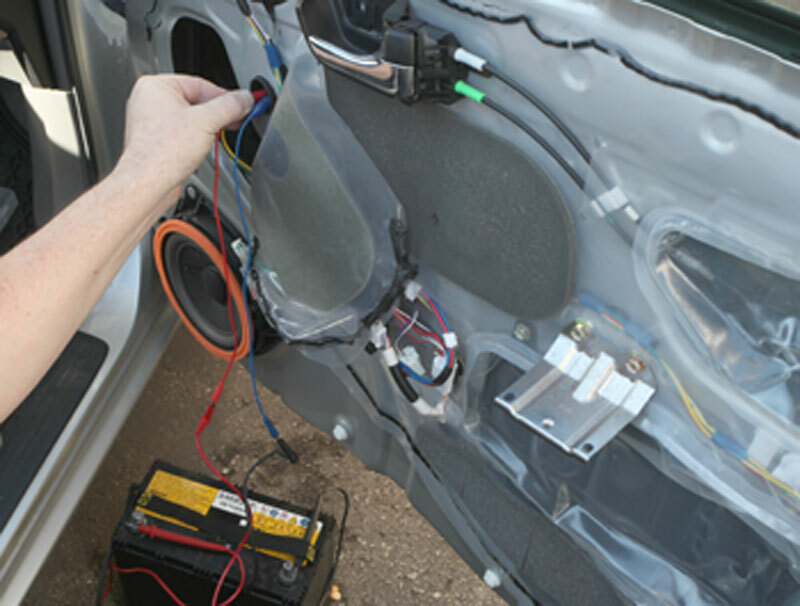 The window motor comes together with the window regulator as an assembly for this car. The new part was less than $100 and it took around one hour to replace. 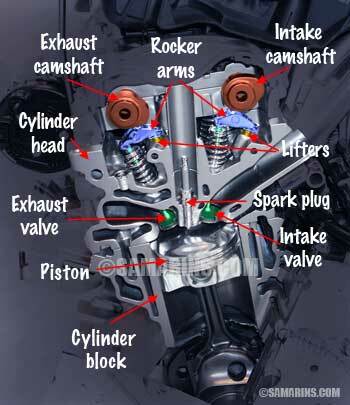 This post has links to sources offering the service manual online.